QuickBooks Premier - the #1 rated small business accounting software - QuickBooks helps you save time so you can focus on running your business. By learning to navigate QuickBooks, it can make bookkeeping easier. This class provided the basic knowledge to set-up and navigate through the desktop QuickBooks Premier software. This is a hands-on course in a computer lab. 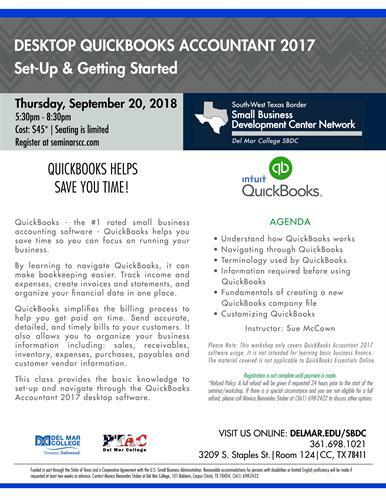 *Please Note: This workshop only covers QuickBooks Accountant 2017 software usage. It is not intended for learning basic business finance. The material covered is not applicable to QuickBooks Essentials Online. Registration & Payment Deadline: Thursday, September 20, 2018; 8:00am (Registration is not complete until payment is made.) Seminar fee assistance is available for qualifying businesses. Refund Policy: A full refund will be given if requested 24 hours prior to the start of the seminar/workshop. If there is a special circumstance and you are not eligible for a full refund, please call Monica Benavides Stuber at (361) 698-1021 to discuss other options. If the event is cancelled, all fees will be returned.